For larger quantities than 3 lbs., please contact me for a quote. For orders in the area of Wood River,Ne, Alda, Ne, Grand Island, Ne, use the check out buttons below if you would like free delivery. Of course I will not give out the recipe that grandma perfected to make this wonderful candy. But I can tell you that it was always made with love. As I started making it the first few times it never really turned out like grandmas. After a few batches and several phone calls, Grandma Minne helped me perfect it to be just like hers. I started making it years ago for my family, then some for my friends. As word got out about how good this special treat was I was encouraged to start selling it to others. 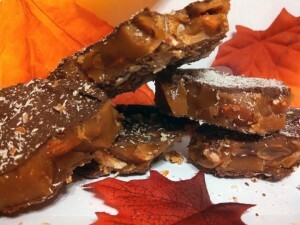 I hope you will give Minnie Paula's Almond Buttery Toffee a try. I know you will love it just as much as we do. This product does contain Almonds. Be aware if you are allergic to nut products. Allow 7-10 days for mail deliveries. Include a phone number or a way to contact you, for local deliveries. Make one purchase at a time.